There is unequivocal scientific evidence that our planet is warming, primarily as the result of human activity since the mid-20th century. The planet’s average surface temperature has risen by about 2.0 degrees Fahrenheit (1.1 degrees Celsius) mainly in the past 35 years. Warming oceans, shrinking ice sheets, and glacial retreat are very common today. The sea level has risen by about 8 inches during the last century. These changes are largely driven by increased carbon dioxide and other human made emissions into the atmosphere. While at the global level we are still arguing on the sources and effects of climate change on the planet and people, often driven more by self-interest than scientific evidence, we in the developing world continue to suffer, even when we are not the culprits. Carbon dioxide emissions at 11.2 tonnes per capita in the high human development countries was 27 times more than that in low human development countries in 2010. For us climate change is real. The case in point is Zimbabwe. Just as for the planet, Zimbabwe’s climate is warming. We experience more hot days and fewer cold days than in the past. Our average temperature will be 0.5 to 2 0C warmer by 2030. The implications on livelihoods, well-being and human development are huge. 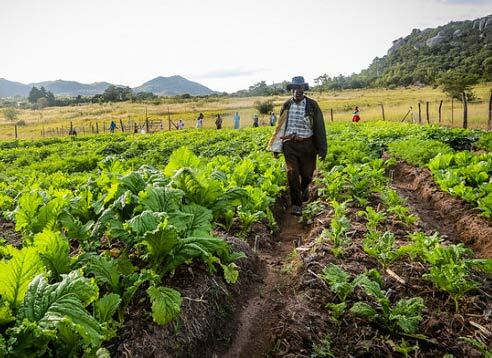 Most Zimbabweans rely on rain-fed agriculture and livestock for a living, so frequent droughts and floods have serious implications on their crop yield and – hence – their incomes. The Global Hunger Index (GHI) already puts Zimbabwe in the “serious” category on the GHI severity scale. Moreover, even a slight change in temperature and precipitation might increase the frequency of vector-borne diseases, including malaria, dengue and yellow fever epidemics as well as water-borne diseases such as diarrhoea and typhoid fever. Zimbabwe is already experiencing frequent outbreaks of cholera and typhoid. Hunger is low on average but rises sharply in some seasons. So, it is not a surprise that a million people in Zimbabwe are vulnerable to adverse climate shocks. The recent drought, which was followed by violent floods put over 4.2 million Zimbabweans – more than a quarter of the total population – in need of food assistance. These shocks will constrain or even reverse the gains in human development that Zimbabwe has made over the years. Strengthen national capacity to adapt to the effects of climate change, including efficient management and use of water, the promotion and rehabilitation of water related infrastructure such as irrigation, and investments in water harvesting techniques. Invest in climate smart agricultural technologies, including developing drought tolerant high yielding varieties of crops. Land and crop suitability mapping, diversification of crop production, including promotion of drought resistant small grains, and exploration of biofortified crop production. Adaptive interventions for livestock production, including planned de-stocking and encouraging the rearing of heat tolerant indigenous breeds and improved livestock feed during droughts. Introduction of school based health and nutrition programmes. Promote renewable energy adoption and the reduction of wild forest fires. Strengthen the early warning systems to monitor, detect, forecast and provide up-to-date information on climate change issues for timely action. Strengthen disaster risk management to deal with flood related and other disasters efficiently to limit the danger to human life. Protect wetlands as a buffer against flood waters and regulate property development in wetlands. Develop a strategy for climate proofing infrastructure, including through choice of location and design of new infrastructure. Establish a comprehensive social insurance and social safety net to support poor people when affected by natural disasters. Promote diversification of livelihoods, and improved and diversified production as a climate resilience measure. Improve financial and non-financial channels for remittances to help manage temporary or permanent shocks and to escape climate induced poverty. Build social capital through collective work such as food-for-work programmes to absorb the stress of food insecurity. Introduce weather-based insurance to minimize the risks of loss of investments to smallholder farmers. Integrate climate change issues into development planning process at all levels, including national, district and local level. Improve coordination among public institutions, the United Nations, development partners, private sector and the civil society about climate change issues. Use grassroots structures as a core building block for climate governance for context specific local climate action and effective and timely responses. Strengthen disease surveillance systems for early detection of disease outbreaks and action. The national human development report has so far received wide acceptance by all the stakeholders. The live twitter messages reached over 4.5 million users on the launch day itself. The Minister of Environment, Water and Climate, Hon. Oppah Muchinguri-Kashiri, wants to a have a partnership built to jointly implement the recommendations of the report. A high-level panel discussion on “Towards building a climate resilient nation” is planned for the 18th of June 2018 to further brainstorm the findings of the report and actions to be taken. Plans are also underway to have “Green Talks” with the youth for sharing their perspectives on climate change and its impacts on human development. This would also help inculcate environmentally-friendly attitudes among young people.